Borderlinx | Buy Jaguar and ship worldwide with Borderlinx. Cheap rates guaranteed. Founded in England in 1922, Jaguar USA is a multinational manufacturer of sports and luxury cars. Jaguar USA identifies as a highly dynamic brand that makes cars that roar. In 2014, Jaguar USA was recognized as a J.D. Power Customer Champion based on its extremely high level of customer service. In 2013, Jaguar USA was noted as the fastest growing major premium brand in the U.S. and recorded exceptionally high sales, selling 76,668 vehicles globally. For luxury, power, thrill and exhilaration, choose Jaguar USA. Jaguar USA is currently offering four models of vehicles: the XF, XJ, XK and F-TYPE. The Jaguar USA XF is a supercharged sedan that allows you to experience the fusion between power and elegance. For even more luxury, the Jaguar USA XJ offers breathtaking, sumptuous comfort. If you're a more sporty type, opt for the Jaguar USA XK or F-TYPE in coup? or convertible for a thrilling ride. The outstanding Jaguar USA craftsmanship on all models will have your pulse quickening. To add personal touches to your vehicle, Jaguar USA Accessories offer different options for the exterior and interior of your car. Performance, efficiency, luxury, elegance and power define Jaguar USA. 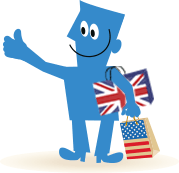 With Borderlinx you can shop Jaguar in the USA and ship to your home country. You pay cheap international shipping, tax & duties upfront, which you can calculate using our shipping cost calculator. A number of services are available through Borderlinx to make international ordering from Jaguar USA hassle-free, including concierge, free repacking and consolidation.